During July 2012 when Rode Trip previously visited Mount Desert Island, Maine we had a whopping 4 days of cruising under our belts. I use the term cruising lightly here; in reality it was more like day sailing meets motor camping. I’d have gladly traded places with a motor camper to have had solid road under my feet, an anchor rode just didn’t provide that same stability. Previously at Mount Desert Island we thought, “Cool, we can totally crash our friends’ vacations!” We blended nicely with an eclectic mix of outdoorsy vacationers as we balanced grocery shopping and laundry with tide pooling, hiking, pleasure sailing, and playing tourist. We skipped along through Bar Harbor on our way downeast. Now it’s July 2013 and we’ve returned to Mount Desert Island, Maine as cruisers; thousands of miles of sailing experience under my belt (added to Brian’s already hearty resume) and no longer hoping for solid road but eager to drop the hook and rest upon our own rode in exotic places. Apparently we’ve also sailed ourselves through a time warp because we hadn’t planned to have returned to Maine quite this quickly. Our thinned, Caribbean blood is cursing us with shivers as we adjust to the cool temperatures and frigid water. Yes, we’ve already lit our Newport stove. Now we visit Mount Desert Island with new perspectives and the advantage of familiar territory. 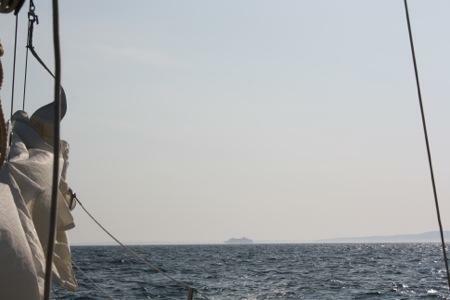 Here’s our breakdown of Mount Desert Island, cruisers’ style, as accessed from the Bar Harbor anchorage. The Town Dock – The friendly, helpful Harbormaster (Charlie) and his assistant (Jake) are just a VHF call away; they monitor channels 16 and 09. Call ahead to request dock space where you can tie to a practically new dock and fill your water tanks for free. The town dock does offer overnight dockage and there are town moorings available nearby on the east side of the bar; ask the Harbormaster about pricing and availability. During our stay the town dock was bustling with lobster boats, dinghies (free dinghy dock, check in w/Harbormaster every time you come ashore), motor yachts, a mini-cruise ship, and sailboats. The Anchorage – Bar Harbor is divided by “the bar”, it’s namesake. Mount Desert Island and Bar Island are connected by this rocky/sandy bar but only at low tide. During low tide hundreds of tourists (thousands when the cruise ships are visiting) walk across the bar to hike the 1m trail to the end of Bar Island for a lovely view of Bar Harbor. The east side of the bar is closest to town. On the east side you’ll find a mooring field with resident lobster boats and town moorings, the town dock, and the fuel dock. The east side of the bar, per our experience, is nearly always rolly. On the west side of the bar there is ample room to anchor amidst lobster pots. The west side offers protection in everything except north and northwest winds and is not rolly. There are advantages and disadvantages to the west side, as any anchorage, in this case the bar presents both. At high tide you can easily dinghy over the bar and dock at the town dock, but to return at low tide you’ll travel ALL the way around Bar Island. At high tide or low tide you can dinghy to the street entrance to the bar, Bridge Street, for easy access to groceries and laundry but you’ll find this location not ideal for securing the dinghy for long periods of time. Those of us who prefer good sleep will sacrifice instant access to town for calm waters. Acadia National Park – Mount Desert Island (MDI) is the largest island in Maine. Of the island’s 108 sq miles the Acadia National Park comprises 54 sq miles. 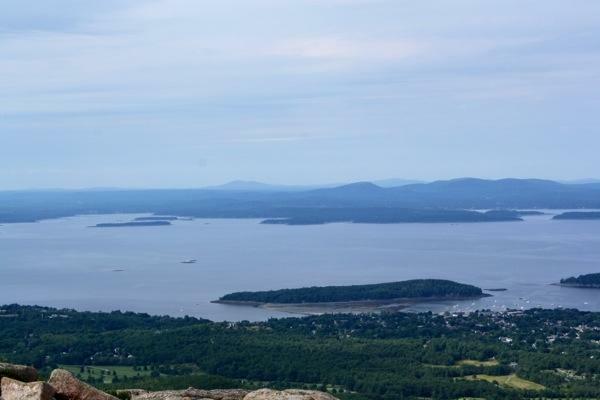 Not only can you enjoy the beautiful scenery of Maine from your deck you can also hike, climb, bike, kayak, camp, and even swim within the pristine park grounds. Stop by a visitors’ center in downtown Bar Harbor for a trail map and tally-ho! Free Public Transportation – A cruiser’s dream! The bus system at Mount Desert Island is called Island Explorer and is entirely free. We can all thank L.L. Bean for their $3 million contribution to this mode of transportation. Though donations are welcome, I’m sure your next sleeping bag, pair of hiking shoes, or coffee mug will continue to support L.L. Bean’s financial relationship with Acadia National Park and the Island Explorer. 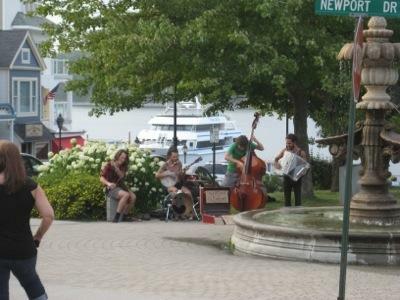 Pick up a bus schedule at a visitors’ center in downtown Bar Harbor and start exploring! Convenient Grocery & Laundry – Just a few blocks walk west from either the town dock or Bridge Street at the bar you’ll find a Hannaford grocery store located on Cottage Street, which runs parallel to the harbor. All the comforts of the good ‘ol USA can be found at Hannaford in addition to wine, beer, and liquor. Behind the Hannaford you’ll find a laundromat; for $2.00/load ($ .25/ 5-mins for drying) your clothes can wash while you shop. Ice Cream – We’re cruising in a tourist town and that means each street corner has a gift shop and ice cream parlor. Since we are thrifty we rarely treat ourselves to this sweet, cool treat (honestly in Maine I’d prefer a hot bowl of chowda) but after a hike ice cream is quite refreshing! Our pick is Mt. Desert Island Ice Cream near the Village Green where you’ll find the bus stop. Go ahead, balk at the price, then reach deep into your pockets and enjoy one of the several scintillating flavors offered at this organic ice cream parlor. Micro Brews – I’ve saved the best for last! Since we’ve arrived in Maine not a day has gone by that we haven’t had a delicious micro brew. Ahhhh… Brian and I have sampled, ok guzzled in some instances, 13 of Maine’s 36 brews. I dare say completing the trial may be the objective of our next cruising plan. Mount Desert Island is home to Atlantic Brewing Company (free tours/sampling at the brewery located at Town Hill) and home to Bar Harbor Brewing Company (owned by Atlantic Brewing Co.). You can sample Bar Harbor Brewing right in downtown Bar Harbor. Browse the beer isle at Hannaford and take your pick! We said farewell to Mud Hole on Friday, July 13th…goodbye to the seal-laden rocks, bald eagles, puffins, auks, all-you-can-eat free mussels, starry skies, and all the splendor of downeast. 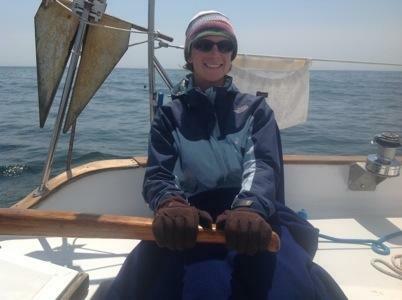 We had a loooonnng, uneventful upwind sail on Friday; nearly a 12-hour day on the water. As you can see I eagerly anticipated returning to warmer climates…and people! Between shifts steering, I do try to knit and/or read but can still only do these things in small doses while underway because they result in motion-sickness headaches. Mostly, I stay on deck even when not steering but a 12-hour ocean view doesn’t have much to offer for entertainment. As we rounded Schoodic Point and re-entered the Acadia National Park area, we spotted numerous people along the rocks and felt a “touristy” sensation. Just one week ago Acadia and Mt. Desert were wild! After our downeast experience, they were not so wild but certainly still beautiful and rugged even though speckled with people. We saw the outline of a cruise ship in the distance and breathed a sigh of relief that it was heading away from Bar Harbor. 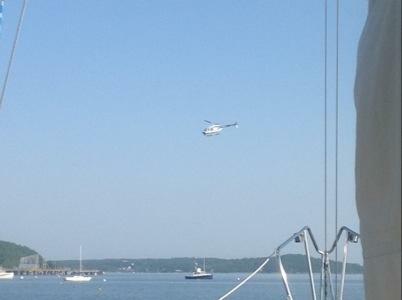 We awoke on Saturday morning to the sounds of, hmm not a lobster boat but…a helicopter! UGH! It was making laps around the top of Rode Trip circling to and from a position over land. I hope whatever was so interesting made the news! On the agenda for Saturday was laundry and grocery shopping. BIG day! This would be our second provisioning day thus far and we found it ironic that both days had landed on weekends. We’ve been stocking our cooler with food for about 10 days at a time. Since it was chilly downeast there certainly wasn’t any sweating and we pretty much wore variations of the same outfit all week, quick-dry pants and sweaters, so the laundry load was small. Bar Harbor was convenient for both as it was a short dinghy paddle to shore and a short walk to Hannaford and the neighboring laundromat. 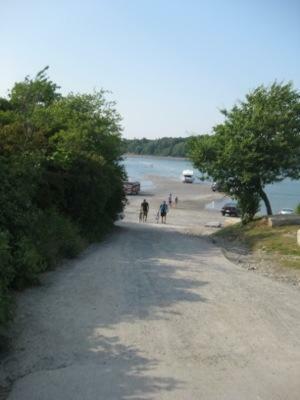 There is a sandbar between Bar Island and Bar Harbor, able to walk between the two at low tide. The sandbar was swarming with people out to explore Bar Island while it was walkable. We beached the dinghy here and walked into town. While the clothes washed we did our shopping and paddled everything back out to Rode Trip. Then another trip ashore to pick-up the dry clothes and get ice and cold beer to add to the cooler. 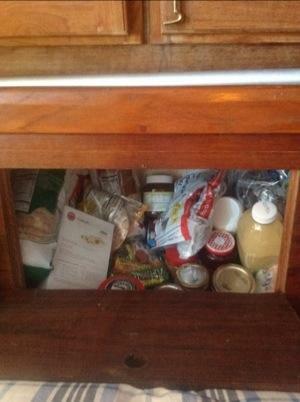 Now we are stocked to the gills, again. 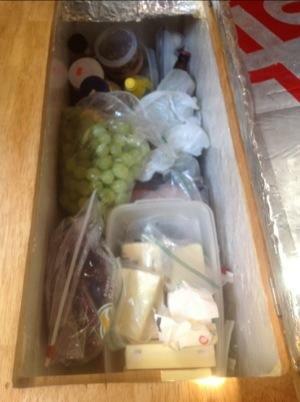 Yes, that does mean that anytime we want something from the cooler…everything comes out! Just part of the daily workout routine! Chores done! One more paddle to shore to enjoy Bar Harbor. We treated ourselves to dinner, browsed stores and listened to some music in the park. Loved the Sweet Street Symphony! 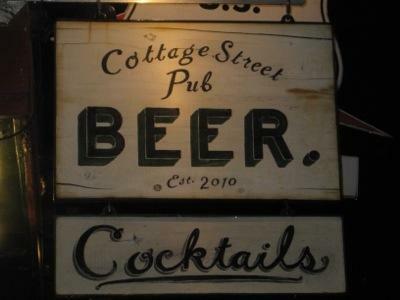 We waited out a brief thunderstorm at the Cottage Street Pub, enjoying delicious Peak IPA and blueberry mojito. We befriended owner, Tessa, who provided great hospitality in a fabulous atmosphere (not to go unmentioned was the outstanding list of cocktail options, heavy in gin and rum bases…YUM!). We chatted with some other guests at the bar too and enjoyed their company. 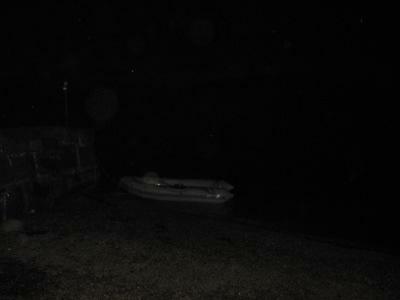 It was raining lightly on our walk home, and our trusty dinghy was close at hand thanks to high tide. Who knew doing chores could be so fun!